Geek Lit Etc. : Manga Monday: Are we finally finding out where everybody stands? It's amazing how no matter who Eren decides to trust, betrayal is the inevitable outcome. Bertolt and Reiner are beyond the point of no return, and even Ymir's motives are questionable anymore. As the Colossus Titan and the Armored Titan attack, Eren and Ymir are taken away by them into the forest, where their fates remain undecided. After the battle, Mikasa and Armin regroup with Hannes atop the wall. Their fighting forces have been absolutely decimated, their lead fighters are gone, and Mikasa has withdrawn into her scarf again. Morale is low, but Hannes rallies the troops and refocuses them on their mission to protect humanity - and Eren. This late in the series, one assumes that the reader would have some grasp of what's going on, but Attack on Titan continues to raise more questions than it answers. Hopefully some of these plot points begin to come together, before the reader becomes so lost that they give up. Highs: Hannes' speech to Armin and Mikasa was exactly what they, and the reader, needed to hear in such a time of despair. Lows: There's so much going on right now, and so many plots within plots, that it's becoming a job to keep them all straight. 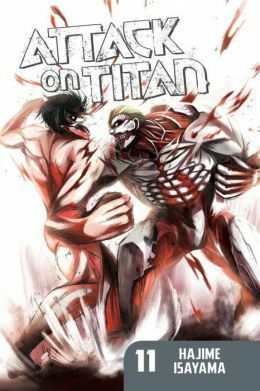 Verdict: Attack on Titan Volume 11 continues the story in the same grand tradition, but readers looking for answers will have to continue to wait.